A typical Maharashtrian nath is an ornament worn by women on her nose at some special occasion such as wedding or a pooja. It is woven with pearls & studded with pink or white stone in the middle. Nath is a nose ornament that is unique in design than any other nosepin and it completes the traditional look of Maharashtrian women. 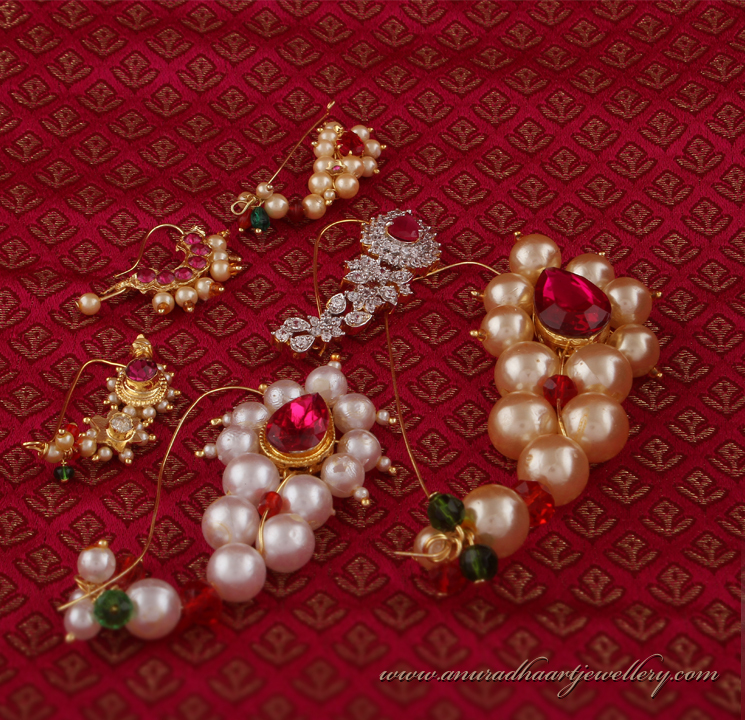 Nath comes in different style, Bramhani nath is one of the famous nath studded with basra pearl & emerald. 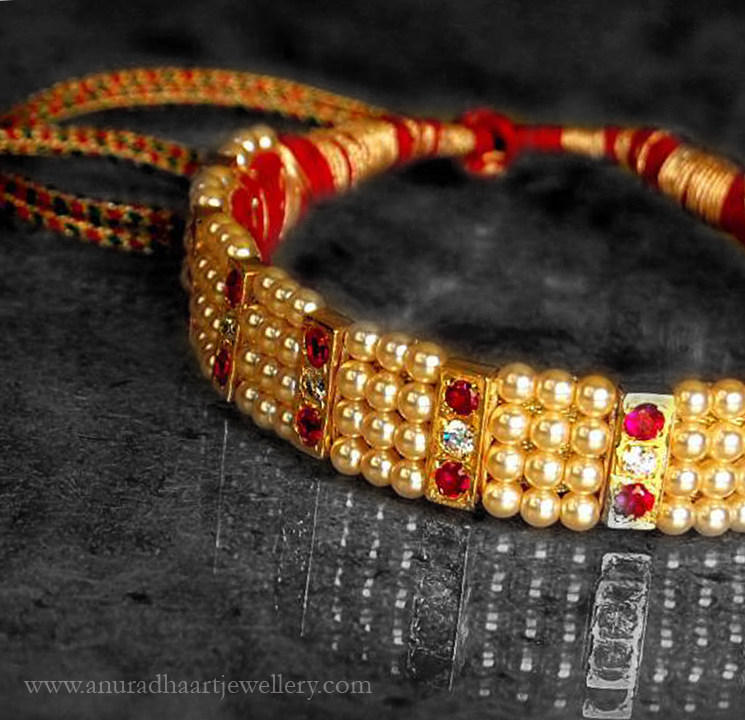 Thushi is a choker style neckpiece woven with the gold beads very closely. It comes with an adjustable dori so that you can adjust it according to your neck. It looks nice when teamed with paithani saree. Mohan mala is a long beaded golden necklace having many layers of golden bead strings. The layers may be 2-8, they may vary. 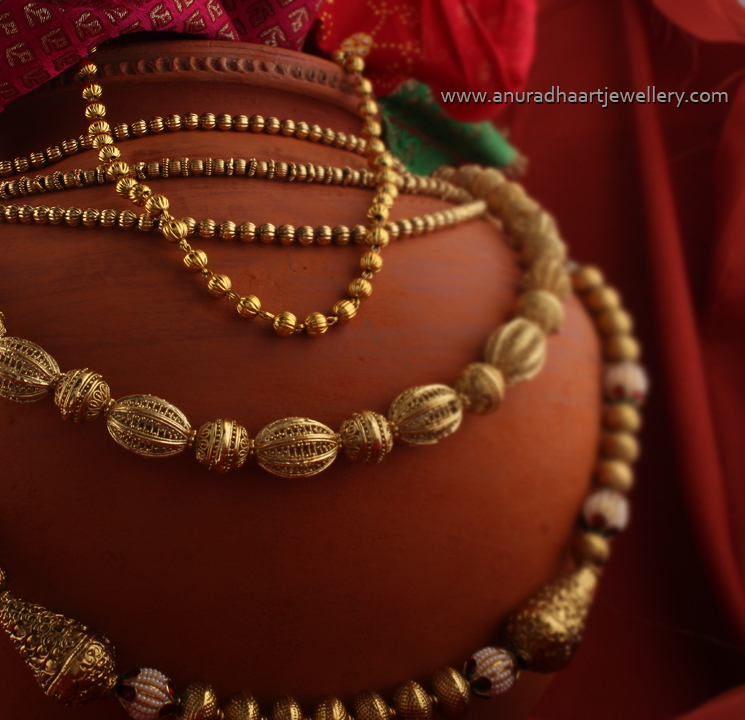 Lakshmi haar is also known as coin necklace or temple necklace. The coin are decorated with intricate carving of Goddess Laxmi & Lord Ganesha. 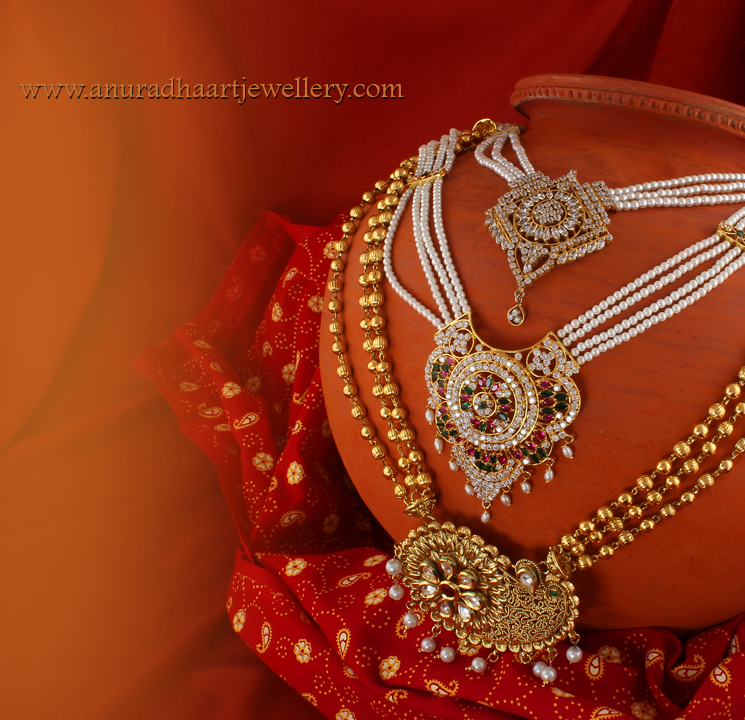 Kolhapuri saaj is very famous among Maharashtrian women & it is as special as Mangalsutra. It is made with jav mani (golden beads) & 21 leaves shape pendent. Every pendent is well-known for its own meaning. Out of these 21 pendent, 10 pendent defines the ten avatar or Lord Vishnu, 2 pendent have ruby & emerald stone, 8 pendent are for ashtamangal (ashta means eight & mangal means good happenings) & last pendent is taviz. 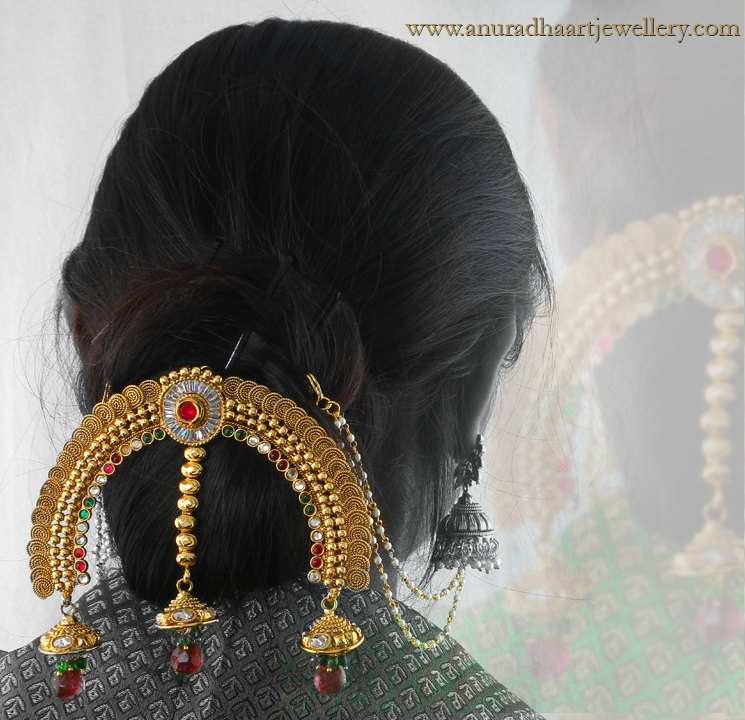 Ambada is a traditional hair style tied in round shape & adorned with antique bun pin (ambada). 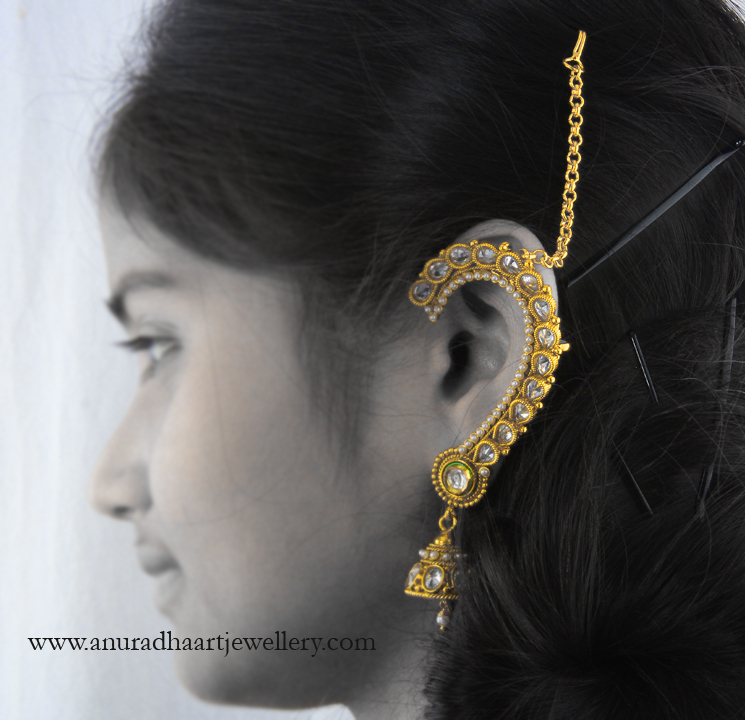 Kaan is a traditional ear cuff studded with pearls or it may be fully golden to beautify your ears. Tikada set is a traditional pearl choker style necklace set crafted from pearls. Tikada set may have one middle pendent or may have several pendent for added attraction. Rani haar is a long pearl necklace set with three layers of pearl string as well a pendent in middle. It looks very attractive & gorgeous when teamed with paithani. Vaaki is also known as armlet or bajuband. 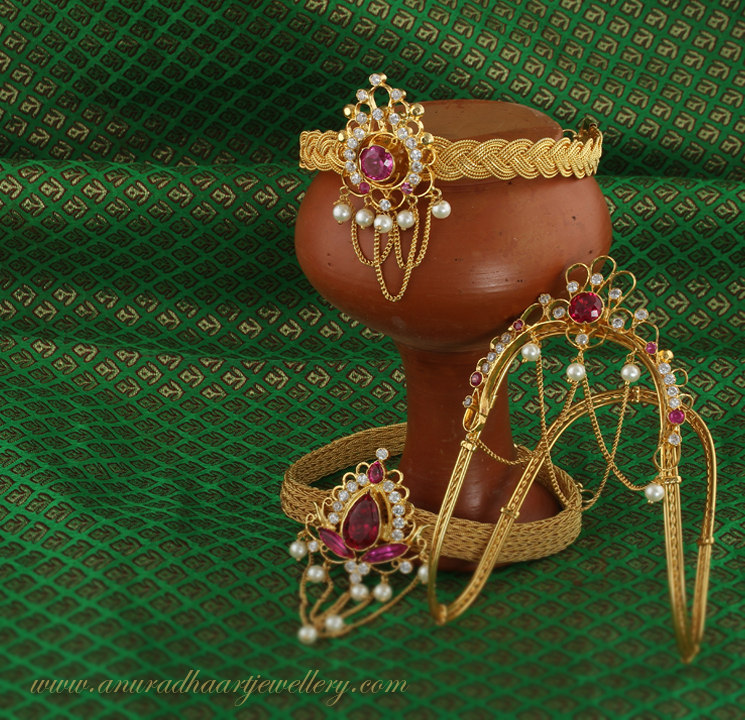 Traditionally it is worn on both armlet but now a day it is worn only on a single armlet. A traditional design is in flat studded with stunning stones in middle. Bugadi is the jewellery ornament which is worn on helix part of the ear. 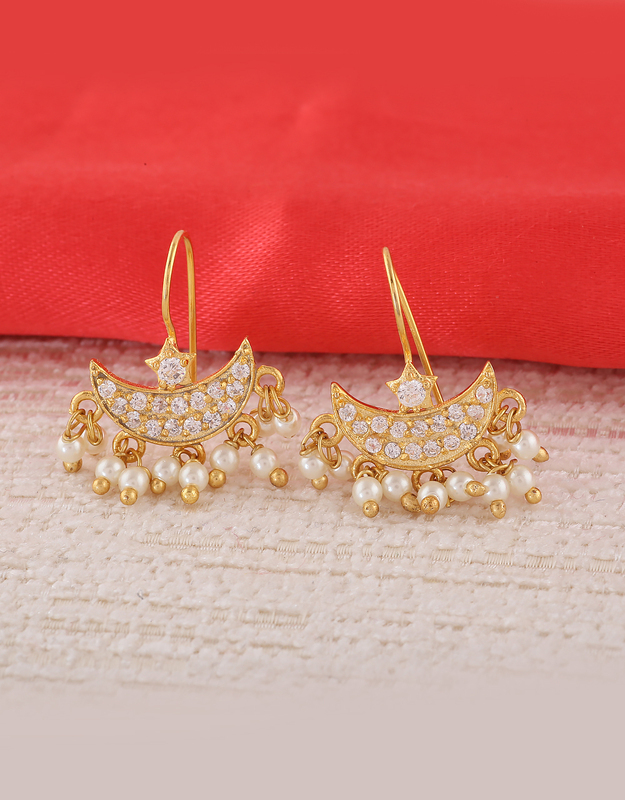 This beautiful ear ornament is mainly worn by Maharashtrian as well Northern women. Maharashtrian Bugadi is usually designed with pearls but now in modern times, there is lots of fancy diamond and oxidized bugadi available in beautiful designs. 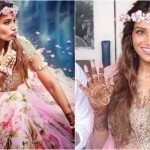 10 Trendy Flower Jewellery Designs you can’t resist this Summer! 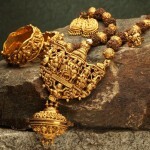 Very nice information about Maharashtrian jewellery. 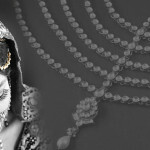 Jewellery Dukan have very nice collection of traditional jewellery online. Very nice information about jewellery really loved the way its written. Reading your blog is pure pleasure for me. Reading your website is big pleasure for me. Hello blogger !! I read your posts everyday and i must say you have very interesting posts here. clips, this website could certainly be one of the most beneficial in its niche. This was a great article about blogging! I will use this for inspiration on my site. wonderful post, very informative. I ponder why the other specialists of this sector do not notice this. Austin Texas! Just wanted to tell you keep up the excellent work! LOOK ELEGANT THIS GUDI PADWA, WITH THESE EXQUISITE GUDI PADWA JEWELLERY DESIGNS! STYLE FILE: TOP 4 HOLI JEWELLERY LOOKS YOU’LL LOVE TO ROCK, THIS 2019! Valentine’s Day Gift Ideas 101: How special can your Valentine gift be? Top 6 Popular Fashion Jewellery Trends you can’t afford to miss, this 2019! #ChooseYourLook: Upgrade Your Jewellery game, with these New Year’s Party Jewellery Trends! #HotTrends: Bridal Jewellery Trends to look out for, this 2018! Please enter your email id to receive updates via email from our blog. Anuradha Art Jewellery Wishes you Merry Christmas!! 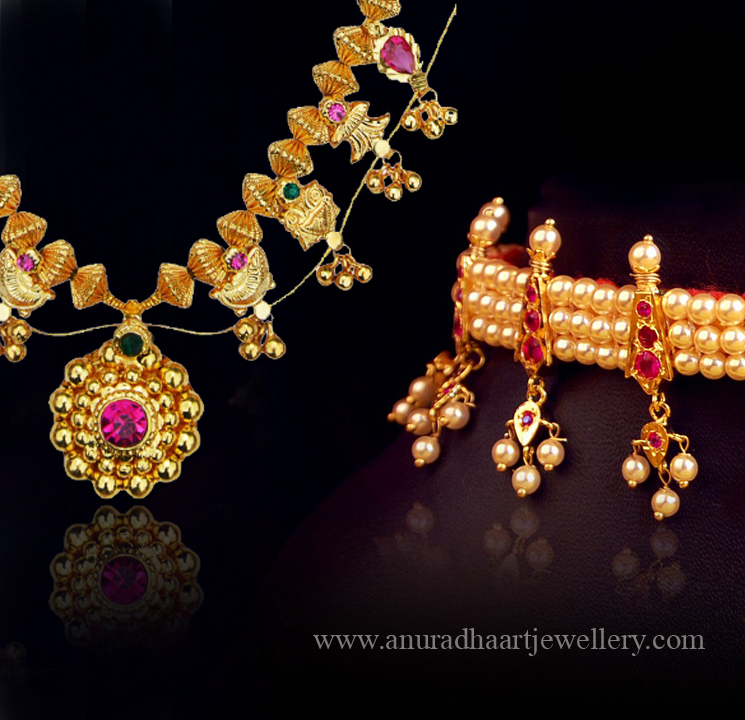 Anuradha Art Jewellery wishes our customer the happy new year 2015! 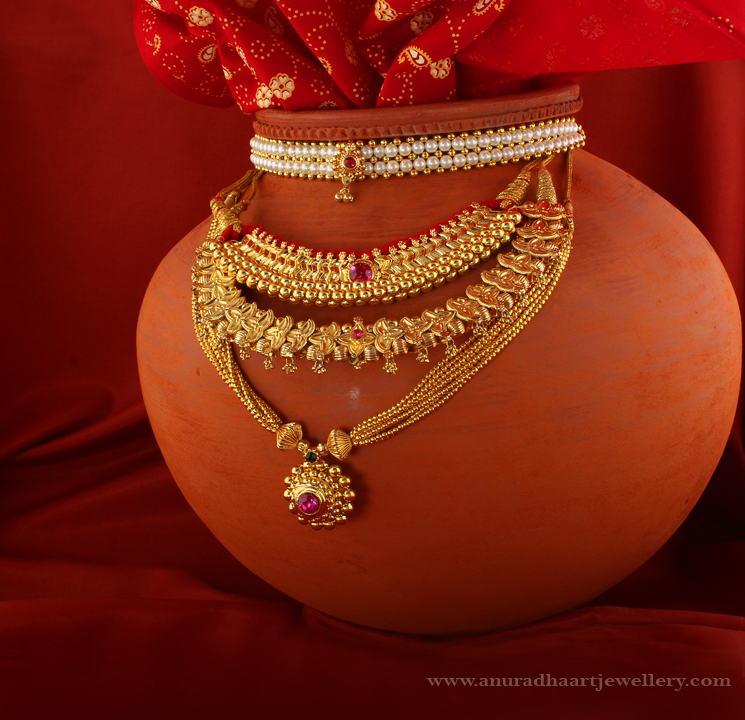 Anuradha Art Jewellery is an e-commerce website that provides designer art jewellery to worldwide customers. Through our website we bring you a wide range of exclusively designed traditional jewellery, American diamond jewellery, Korean jewellery and many more which is a blend of superior quality, beautiful design & excellent craftsmanship. Our collection of fashionable jewellery has been designed by expert designers and handcrafted by the most talented artisans of India. So start shopping now !!! 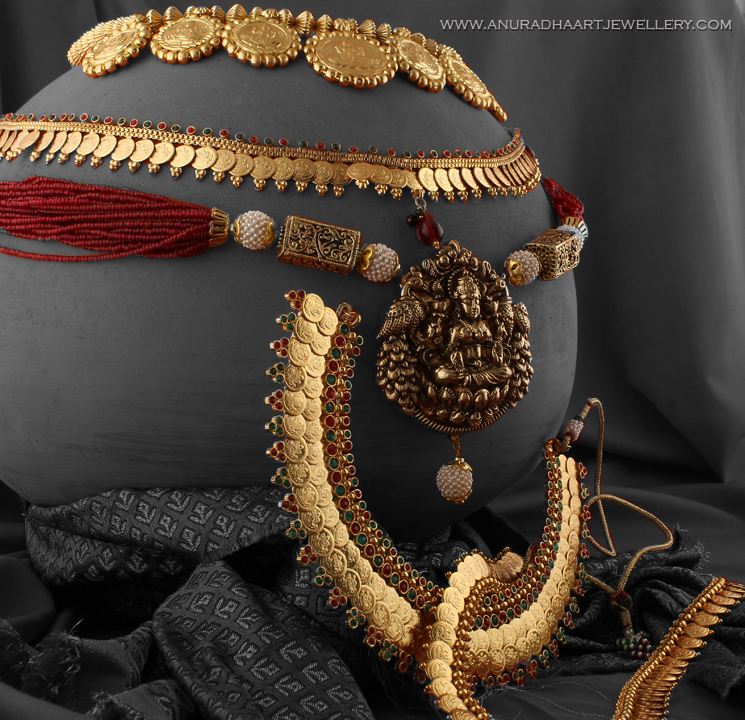 Copyrights © 2015 Anuradha Art Jewellery. All Rights Reserved.